FFOZ is pleased to announce an expanded focus in its new publishing arm, Vine of David. Exactly how much Torah is a Gentile allowed to keep? And how much is too much? A sneak-peek excerpt from the all new HaYesod discipleship program. A Letter from Boaz Michael, FFOZ Director, reflecting on what is happening within First Fruits this summer. An overview of why it became necessary to create a new publishing arm within First Fruits of Zion, and a look at the projects we are working on. Yeshua—radical, rebel, or rabbi? Vine of David translator Robert Morris reflects on a year of translating Hebrew Gospel texts and commentary and offers a fresh impression of our Master. Echoes of Joseph's descent to Egypt ripple through history. It becomes a shadow of Israel in exile that looms over Yeshua, even in infancy. In the Messianic Era, every man will know God, and the veil will be removed. Paul Philip Levertoff wants us to reach for that level of revelation today. A review of our first Vine of David publication, Love and the Messianic Age. Are you struggling with your self-image? Do you feel homely and unattractive? Then remember that a daughter of God does not find her identity in the physical. Is the word "Gentile" a negative term? Does it refer to pagans and idolaters? Is it a term that non-Jewish believers should feel comfortable with? Take a theological journey with First Fruits of Zion as we grapple with the "One-Law" question and our position regarding Jews, Gentiles, and their respective obligations to Torah. 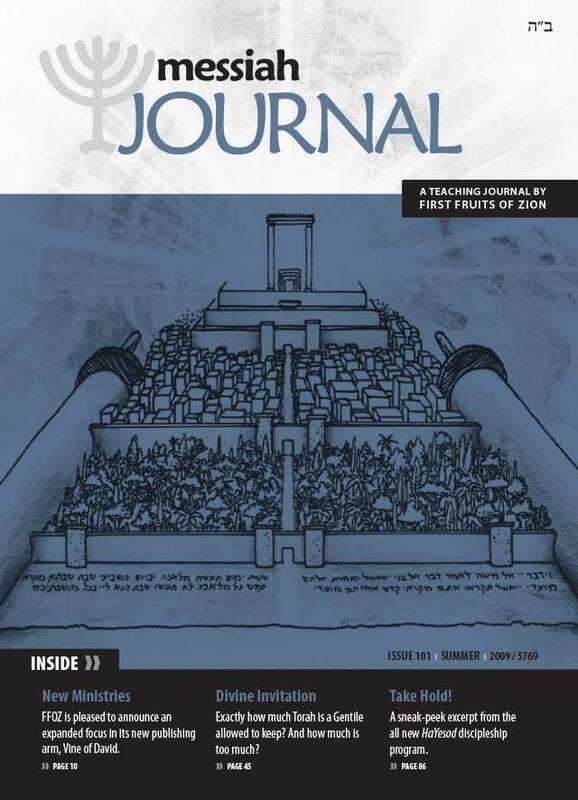 First Fruits of Zion responds to a recent article by the staff of Tikkun International regarding the role of Gentiles in Messianic Judaism and Torah life. Original article online at www.tikkunministries.org. According to rabbinic legal opinions, how much Torah is a Gentile allowed to keep? How much is too much? The answer may surprise you. The all new HaYesod discipleship program is scheduled for release this fall. Enjoy a sneak-peek at the new HaYesod material. First Fruits of Zion reviews two new books about the Jewishness of Jesus, written from opposite perspectives.